We are very excited to announce that Roses for Soldiers is back again this July! In the years past, we have made July all about giving back by donating a portion of our rose sales for the month to charity organizations, and this year is no different. Operation Homefront is an organization dedicated to providing financial assistance to wounded warriors and military families in need, and we are pleased to say that our donations from this endeavor will benefit families that live right in Koehler & Dramm’s 5-state service area: Minnesota, Wisconsin, Iowa, North Dakota, and South Dakota. To learn more, visit www.operationhomefront.org. Koehler & Dramm pledges to donate 2 cents for every rose stem sold in July to Operation Homefront, and we’ve set our 2018 total contribution goal at $6,000! That means we have to sell 300,000 roses… it’s a lofty goal, but we can do it with your help! Simply by buying roses from Koehler & Dramm, you can be involved in Roses for Soldiers, but if you want to take your participation to the next level, we would like to encourage you to run a Roses for Soldiers program in your own shop! Whether you choose to donate to Operation Homefront alongside Koehler & Dramm, another military charity organization, or directly to a military family right in your own community, together we can make a difference in the lives of those who have given so much for us. 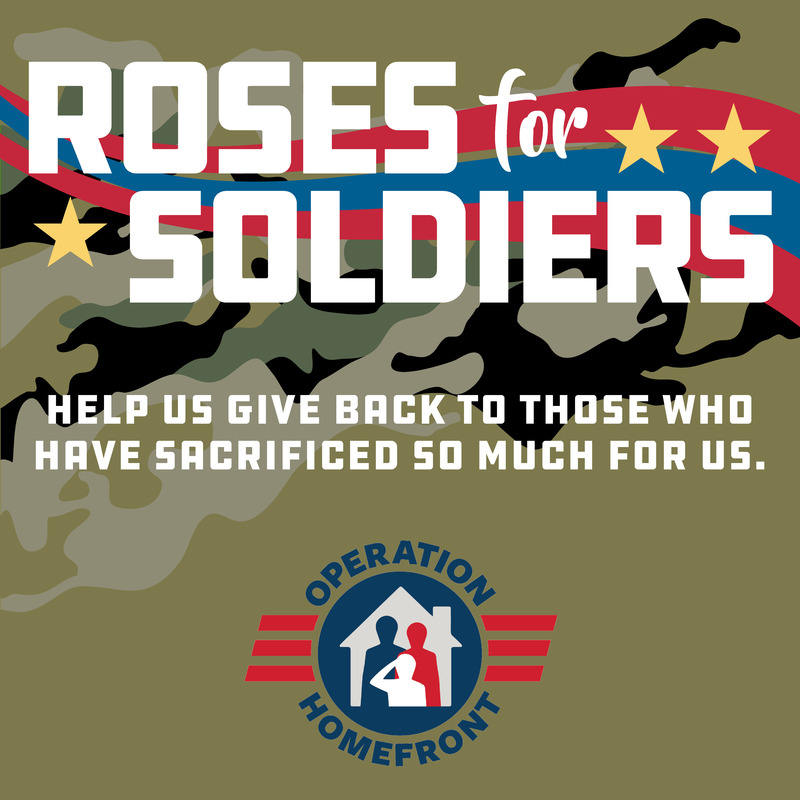 If you would like to give to Operation Homefront, we’ve created a media kit to help get you started with a Roses for Soldiers program. The kit includes an informational booklet and marketing materials (posters, social media collateral, fliers, and more) that will help you run a successful program in your shop. You can request a kit from your sales rep or download and print the materials using the links below. Plus, we’re offering great buys on roses and other products all month long! Good news! We’ve done all the marketing and promotions work for you. Click on any of the links below to download the materials, or feel free to let your sales rep know that you’d like print copies, and we’ll get them sent to you. Please join us in supporting the brave men and women of our military through the Roses for Soldiers program. Questions? Please contact your sales representative, or email the organizers here.